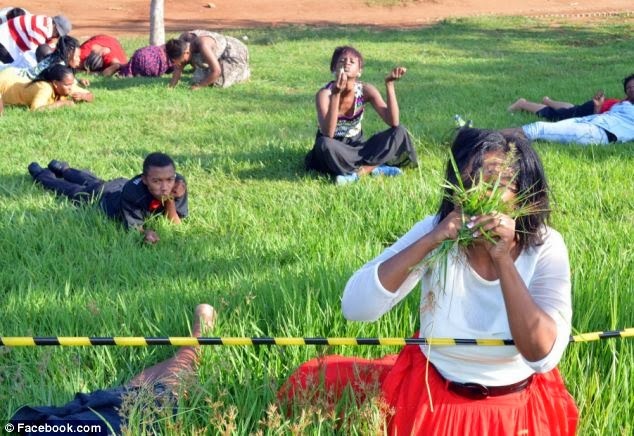 A Letter from Kabwata: Christians Eating Grass? Sad time for Africa my beloved land. Every year brings up its own insanity in charismatics. 2014 the year of favor, is this what they mean't? Bro. Conrad Mbewe...You have spoken the truth. "Let us stop being ecclesiastical witchdoctors and get back to the work of expounding Scripture. Do you honestly think those congregants who were eating grass know their Bibles? No! I have no doubt that what we are seeing here in Africa is the fruit of a century of teaching that says although the Bible is inspired by God it is not sufficient as a tool for instructing believers. We need visions, dreams, prophecies, etc. Having started on that premise and thus unhinging ourselves from “Sola Scriptura”, the trajectory is now reaching alarming levels." It's really sad to see that in this day and age people still follow and believe these con artists.......SAD TIMES,proudly South African??? They are lucky to be eating grass. Their friends in Jonestown, Guyana, drank cyanide and close to 1,000 followers of the cult perished in an instant. The only person I recall in scripture that ate grass was king Nebuchadnezzer. It was a judgment of God upon him. It defies reason, that just because someone is refered to as a 'man of God', that if he tells you to eat grass you would. And if he told you to lie or steal, would you do that? Where does it end? I guess it will only end at Christ's return. The important thing is that we stick with the teaching of the Bible, not the Reformers or Baptists or Puritans. What does the Bible say about spiritual gifts? One thing we know it says is that gifts like prophecy and the word of knowledge, miracles, and healing, are given to individuals as the Spirit wills. That is the teaching of scripture. The Bible also commands "Quench not the Spirit. Despise not prophesyings. Prove all things. Hold fast to that which is good." If someone says the Baptists confession of 1600 and something says X, and therefore we reject the gift of prophecy, that person is despising prophecy based on a man-made confession. If we are to not despise prophecy, we must keep an open mind to the Biblical truth that God does operate through this gift. If we do not, we may quench the Spirit. Another translation says do not put out the Spirit's fire. But we are also to 'prove all things.' If one claiming to be a 'man of God' says to eat grass, we should, with wisdom, test that. It is not the case that all the gifts are given to one 'man of God' in the church. The Reformed, Puritans and other groups have done their part in promoting the 'one-man-show' as well. Someone in the church with a gift of discerning of spirits or prophecy could very well not be the pastor of the church. And the entire body needs to operate. The Bible gives us instructions related to church order in I Corinthians 14. The prophets are to speak two or three and the other are to judge. If a revelation comes to one sitting by, the first is to hold his peace. For ye may all prophesy. Paul said that what he had written were the commandments of the Lord, so we must obey these commands. We are not to reject them based on some elaborate theological argument. Biblically speaking, we can expect true prophets because Jesus said he would send prophets, wise men, and scribes. He says that he that receives a prophet in the name of a prophet shall receive a prophet's reward. Ephesians 4 shows that Christ ascended and gave prophets, among other ministries, to the church. Acts shows the ministry of prophet in the church. I Corinthians 14 shows the ministry of prophets even among a church made up mainly of former pagans (see chapter 11) who were apparently predominantly Gentile. And of course, Peter interprets the prophecy of Joel to indicate that the time for the Spirit being poured out on all flesh (accompanied by prophecy, dreams, and visions) as in the last days. Since prophecy will be present in the time of the two witnesses, and the didactic teaching of scripture is that it is among the gifts given as the Spirit wills, there is no reason to think it will not be given. So while Christ taught that there would be prophets, he also warned about false prophets. The Biblical perspective is that there are both true prophets and false prophets. To reject all prophets as false contradicts scripture. To accept all prophets as genuine contradicts scripture. To reject any prophesying as automatically false is disobedience to scripture. To accept all prophesyings without 'proving all things is disobedience to scripture. People need to start studying the bible and learn to pray there way through...a lot of people need to understand that when they accept Jesus as their Lord and saviour they can come boldly to communicate with God the whole essence of going to church is not to forsake the gathering of our fellow believers.Why is it so hard for people to pray to God instead of falling victims of false prophets...i believe some people like Judas need to fulfil the scriptures...even Cain that killed his brother spoke to God and God gave him a form of concession so what is your sin that you need one so called 'man of God' to help communicate with God.i believe if you pray to God and you don't get response it is better you die like that than be brainwashed by a false prophet. Hello, Great your blog.Beautiful different pictures. I appreciate it. 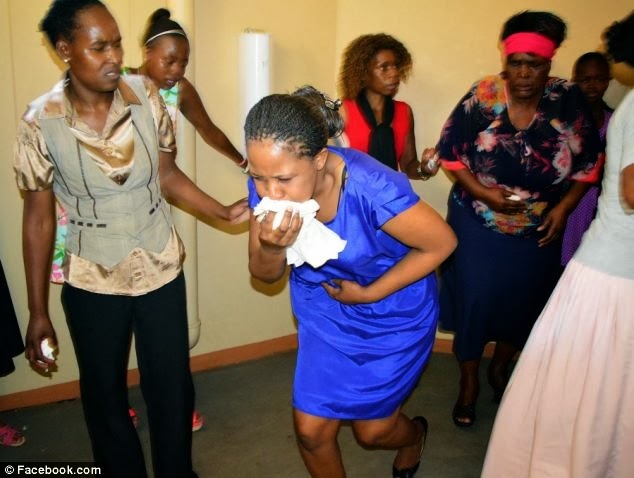 I want to just say that As indicated by a report in African Spotlight, Pastor Lesego Daniel of Rabboni Center Ministries had his supporters eating grass in the wake of clarifying in a sermon that Jesus had numerous different devotees other than the 12 recorded in the conventional Bible who were doing new things which were viewed as whimsical at the time too. Thanks all! !